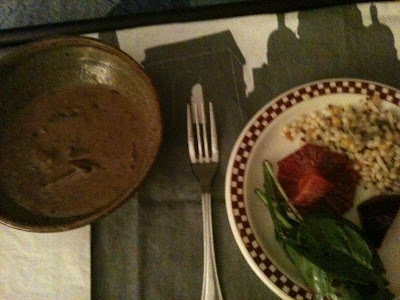 Izzy Eats: The art of raising a gourmand, one bite at a time: The Ant-Cancer Dinner: An outrageously healthy dinner from M! The Ant-Cancer Dinner: An outrageously healthy dinner from M! My friend M. outdid herself, yet again. Greeting me after the first day of my second cycle of chemo, she arrived with tonight's delivery which included a Three Mushroom Soup, a gorgeous Beet and Citrus Salad with Greens, and a side of Israeli couscous with Baby Garbanzo beans. It seems that she based chose her recipes based upon items I highlighted as being part of the Anti-Cancer diet I am trying to adhere to. It is important for me (and everyone for that matter) to eat as many vegetables as possible. I have been craving salads and I am thrilled that friends have been providing them. More on cravings soon...4 days done, 14 to go. Have to rest up for tomorrow. hey there Lynn, I have been reading your blog for ages, cooked many a meal from here but never commented before. I just have to now. Don't know how to say this without be sappy, but you are such a inspiration. I love that you blogging about the cancer, blogging about your chemo diet. I hope this is helping you as well. My thoughts are with you and your family always. if you have any questions or thoughts I would be happy to hook you up with the Healthy Chicks!